I don't like to brag. But if this were my recipe, I totally would. 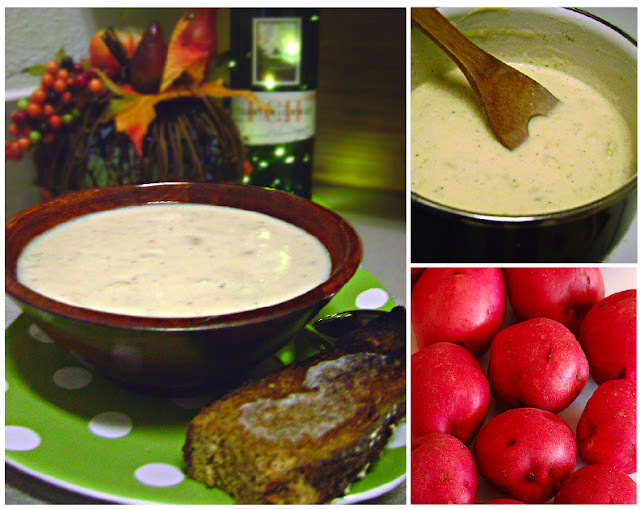 This potato soup is so simple, and after giving this recipe to several co-workers, friends, and family, I constantly hear that it is "the best potato soup they have ever had." Like I said, I can't take the credit, but I can be known as the awesome person who shared it with you. I've realized that this is confusing, so let me make it a little clearer...I'm not talking about an actual can of milk. I just mean that for every can of Cream of Potato Soup you use, you need to fill that empty can up with normal milk, and that's how much you use. It's easier than using a measuring cup. Peel and boil the potatoes potatoes. Some people are intimidated by this step, but it's really so simple. Invest in a good peeler (it'll cost you a whole $5 at Wal Mart). It normally takes about 25 minutes for them get nice and soft. If you're lazy or in a rush, like me, throw the whole potato into the boiling water, skin and all (as is pictured). After they're done cooking and are tender, the skin should fall right off. Or microwave them for about 6 minute. Mash the potatoes, but keep some chunks in there. I like my soup chunky. Add the soup and stir. Now add the milk and stir. Throw in the whole bag of cheddar cheese. Serve in individual bowls, topping with cheddar cheese (some also add chives, sour cream, or bacon bits). If you like it, don't thank me~thank Amanda Odom! Coincidentally, I'm actually making this for her since she just had foot surgery. I wonder what kind of surgery I could fake to make you feel the necessity to cook this soup for me. Love you all! Make this. Trust me. It's flawless.